Do you know that feeling when you come up with an idea and you really want to use a technique? Then you start to imagine the products you want to use and your finished projects looks different from what you had first thought of? 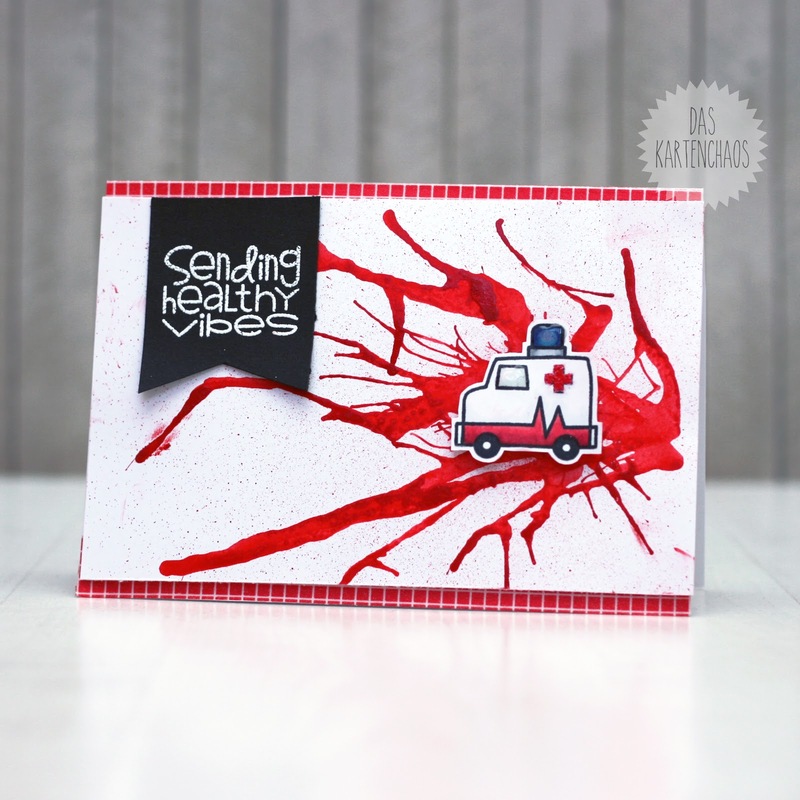 I wanted to use a straw to blow ink around AND my new Paper Smooches First Aid Kit set. 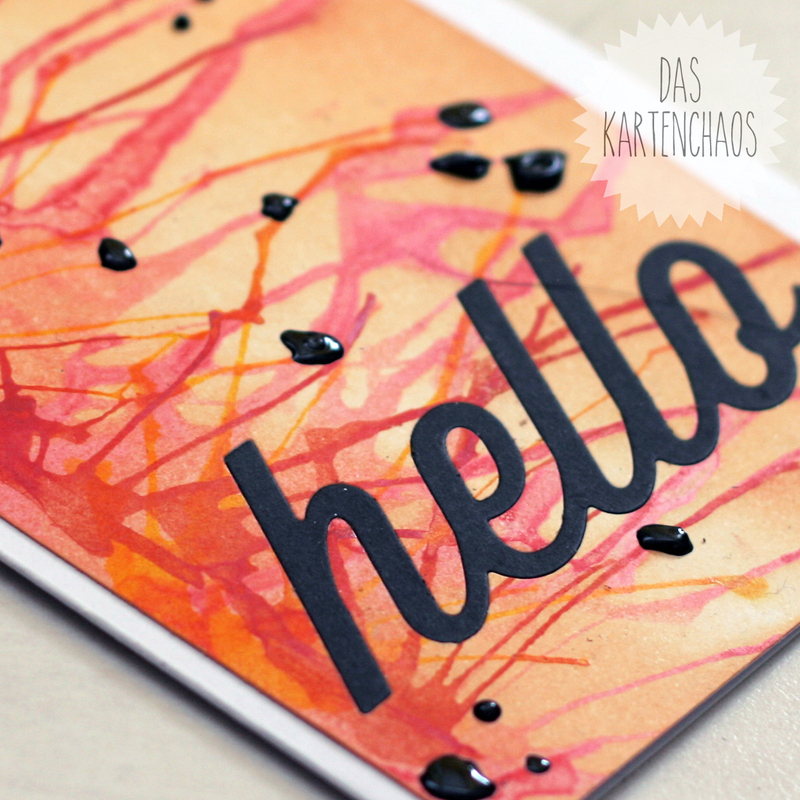 Now I have a bloody splatter card - oops! Well, I like it, but I know many of you won't. Kennt ihr das Gefühl wenn ihr eine Idee habt und unbedingt eine bestimmte Technik benutzen wollt? Dann fangt ihr an zu überlegen, welche Produkte ihr benutzen könntet und am Ende sieht das Ergebnis ganz anders aus, als ihr Euch das zuerst gedacht hattet? Ich wollte die Strohhalm-Puste Technk audprobieren UND mein neues Paper Smooches First Aid Kit benutzen. Jetzt habe ich eine blutige Splatter-Karte - ups! Naja, ich mag sie, aber ih weiß dass sie vielen von Euch vermutlich nicht gefällt. So, check out the Video to see how I did it. It's so much fun and the more you practice the better are your results! Also guckt Euch das Video um zu sehen wie ich das gemacht habe. Das macht so viel Spaß und umso mehr ihr übt, desto besser werden die Ergebnisse! Okay this should have tickled your mojo, right?? If you use this technique, please leave a link - I'd love to hop to your blog and see your creation! Die Karte mit dem Krankenwagen und dem vielen "Blut" ist echt der Knaller. Gefällt mir sehr !! Awesome cards, Christine! Thank you for sharing the techniques and for joining us at ATSM. 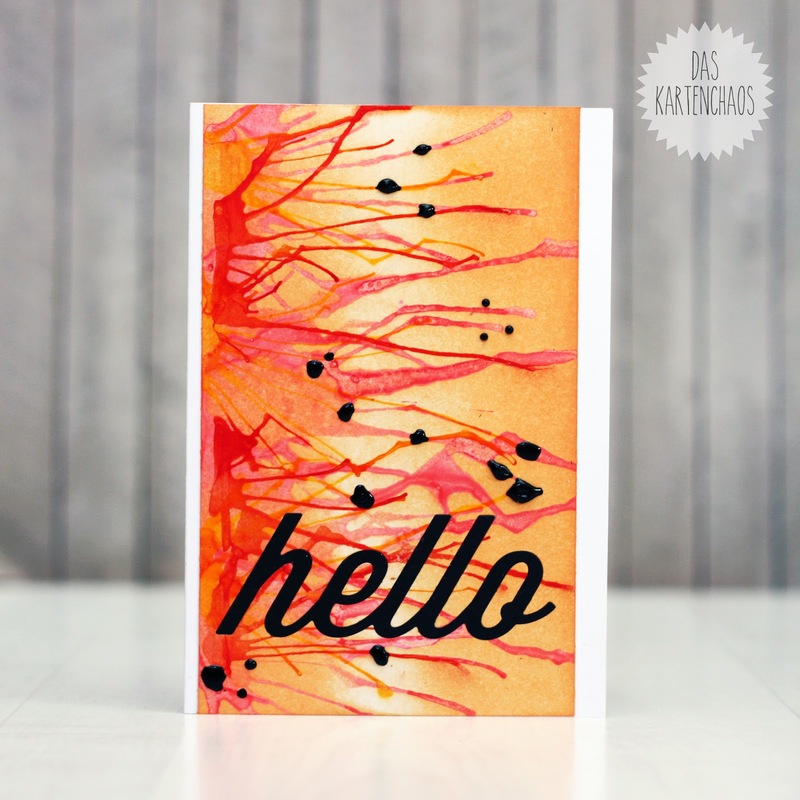 What a nice card, I really love the red spatters and the technique you used! 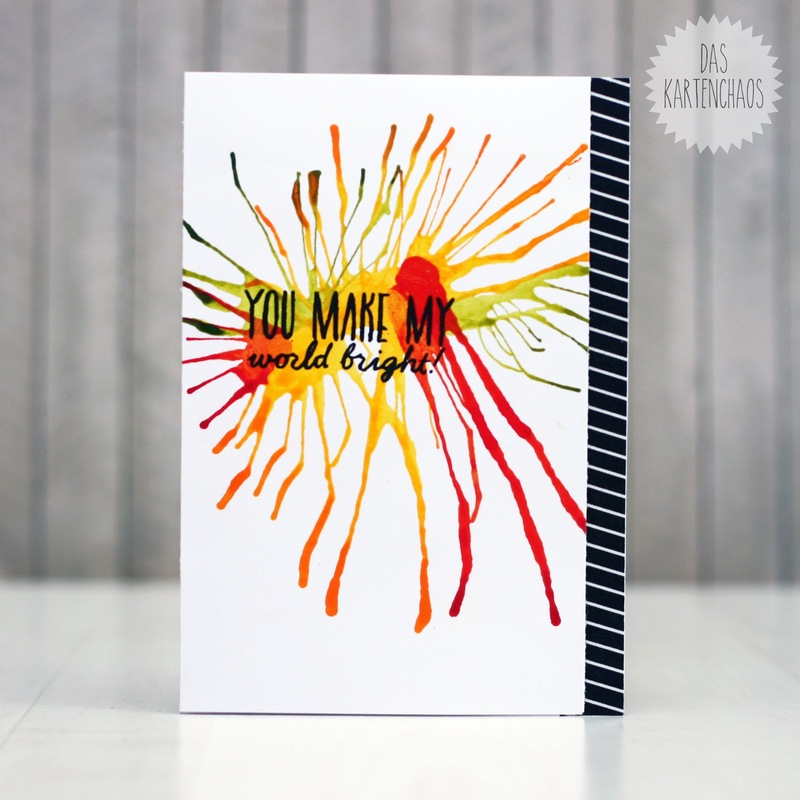 Great cards, this reminded me of my childhood art class :) Thank you for sharing with ATSM! Also ich finde die Splatter-Karte spitzenmäßig. Vielen Dank für diese Inspiration. Was für eine tolle Idee! Da bin ich letztes Halloween nicht draufgekommen :/ na ja, ist ja nicht mehr lange bis dahin. oh my goodness! This is so fun! I remember doing this as a kid but haven't thought of it in ages! Thanks for the idea! So so so so so awesome!!!! I just love these cards!!! All of them!!! The orange one with the 'hello' is seriously incredible!! 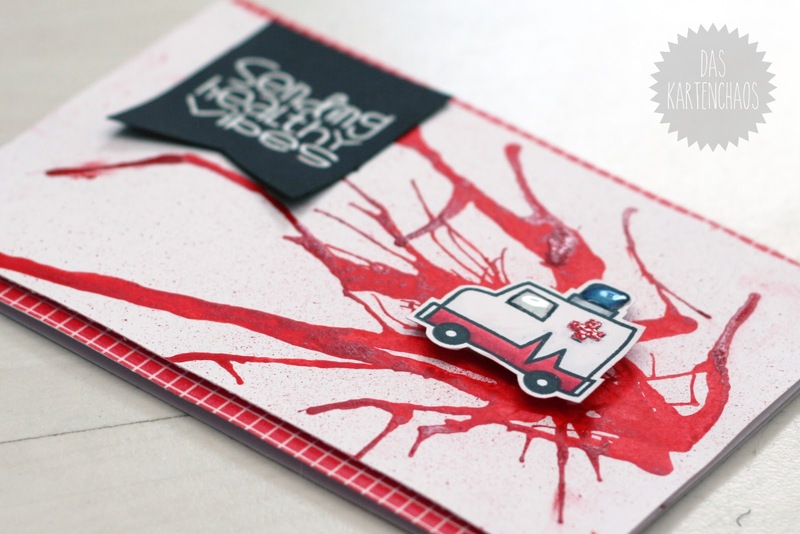 And though the 'blood splatters' may be a bit gory for some, I still think it's a perfect card!! Love! Very cool effect! Love the different effects on all your beautiful cards! My favorite is the thank you card with the greens and yellows! 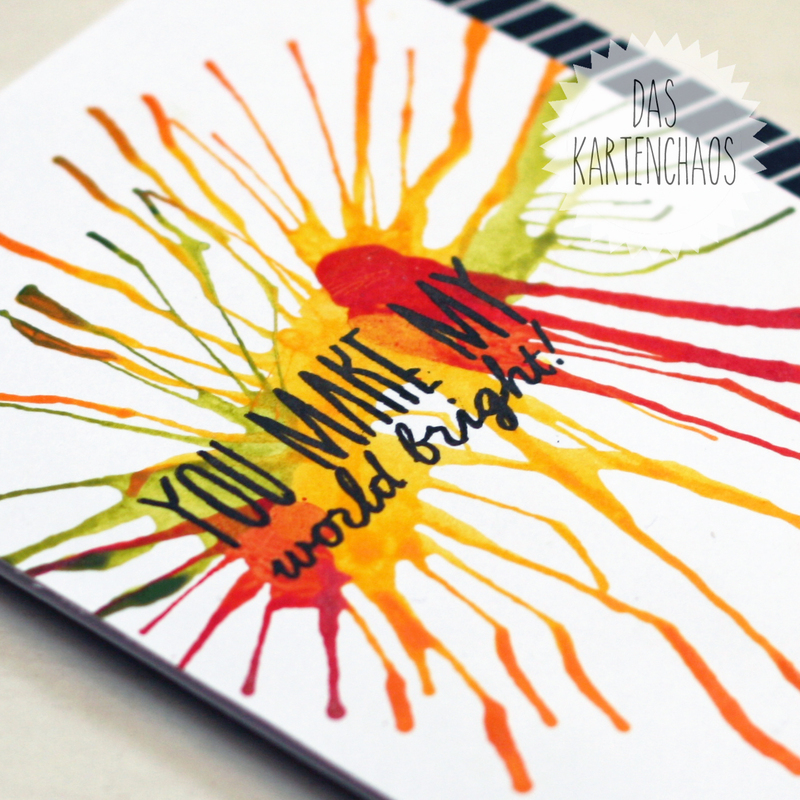 Thanks for playing along with us this week in the Artsy challenge at Simon Says Stamp Monday Challenge! I used a similar effect for the Simon Says challenge too....it's an old technique but a good one! I love your style--your cards are awesome!